This pyramid patio heater from Garden Radiance looks very similar to the Thermo Tiki we reviewed earlier. But there are more complaints about the packaging. The opinions for this pyramid heater are very mixed and go from calling a great heater to to not buy it because it does not give of enough heat. 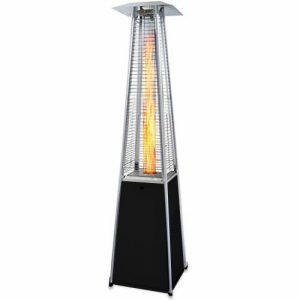 This patio heater comes only in one color and that is stainless steel and a black colored base. This is about the standard size for a pyramid patio heater we found in all our reviews. Some might be a little bigger at the bottom. This is always the part where we spend a lot of our time to find out all the pros and cons of a product we review. What we found out about the Garden Radiance GRP4000Bk is that the opinions are very wide apart form each-other. Some people absolute love it and others would never buy it again. Let’s see what we found. About 50% of the users gave it a 4 or 5 star rating. This is not as high as other brands we have seen. Reason was most that the packaging was damaged, but most of the time the content was still in good shape. Quit a few complaints that not all screws were in the packaging and people had to go to the hardware store for screws. There seem to be cheaper versions that are imitations of this patio heater in stores and people complain more about those than about the original Garden Radiance. The heat that this unit distributes also got mixed ratings. From very hot to, can not feel to much heat. We have mentioned before that this can be caused by a safety in the regulator and you can read here how to reset that. The assembly instructions are not to clear and assembly can take up to 3 hours depending on how handy you are. Pay attention to the right order to put together or you have to disassemble parts of it again. After reading all the reviews that people left on several sites it is not easy to come with a recommendation for this Garden Radiance GRP4000BK. There are very mixed opinions, but some came back several times. The quality was mentioned as good, but not great. The heat distributions also got mixed ratings but like we mentioned that can be the regulator safety. Something to keep in mind is that a patio heater is only for cool nights and mot for use in the winter. This is not the purpose of a patio heater. This unit was appreciated for its nice looks and guests were impressed with how it looked. If you are looking for an affordable pyramid patio heater we can recommend this one. But be aware of the instructions and do not expect the same quality as a much more expensive brand or model. Most important is to use a quality cover for you pyramid patio heater. We recommend the Fire Sense Vinyl cover for your patio heater. You can have a look at it here or when you buy the patio heater look underneath it and order it with the cover. There were some questions about replacing the Glass tube. Someone had it fall over in a storm and needed a new glass tube. you can read all our pyramid patio heater reviews here.